Peel banana and mango, put pulp in the mixer. 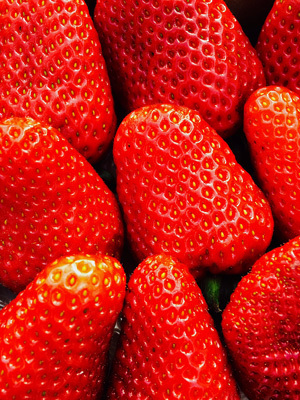 Wash strawberries, remove stalks, add to the blender. Add coconutwater and 1-2 teaspoons, puree for a few minutes. Afterwards pour Smoothie into glasses. For decoration cut strawberries into slices and put onto Smoothie. You also can use desiccated coconut as topping. For those who like it a bit cooler on hot days, put banana and strawberries before mixing into a freezer and let them freeze. 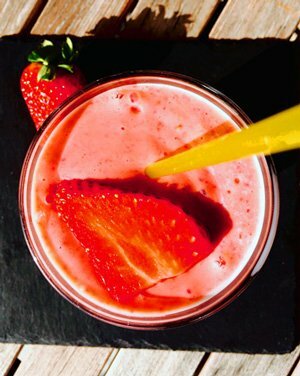 This super-delicious Strawberry-Smoothie brings energy in the morning and helps against hang-over during the afternoon. And the colour is an eye-catcher for itself and perks you up. 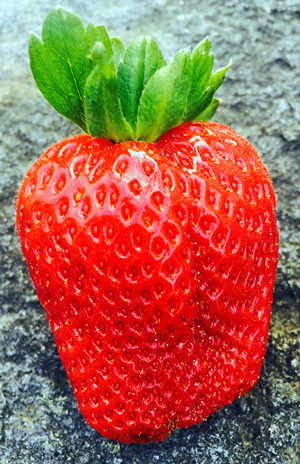 STRAWBERRIES have zero grams of fat and are full of valuable nutrients. Their phytochemicals ferulic and ellagic acid are said to have a cancer preventive effect . In addition, polyphenols and anthocyanins are contained, also good as a defense . The red fruits provide more vitamin C than lemons or oranges, 150 g strawberries are already sufficient for the daily requirement. In addition there are the vitamins A, B2, B3, E and K and folic acid. Calcium protects the bones, iron helps in anemia, potassium and magnesium are good for the heart . BANANAS help to overcome depression due to high levels of tryptophan, which is converted into serotonin - a happy-mood brain neurotransmitter. They are also very nutritious and score with their minerals potassium and magnesium, good for athletes avoiding muscle cramps and getting more energy for a workout. Potassium and a low level of salt also helps to lower blood pressure and protects against heart attack and stroke. MANGO is a strong provitamin A supplier and thus helps in cell renewal of skin, mucous membranes and cartilage and the strengthening of eyesight . Their Vitamin C - five times more than oranges - is good for the immune system and its iron for blood formation. COCONUT WATER contains many nutrients, particularly a lot of potassium. Fat and sugar, however, are hard to find, good for a low-calorie drink . It's isotonic, this means their molecular structure is similar to human blood plasma.